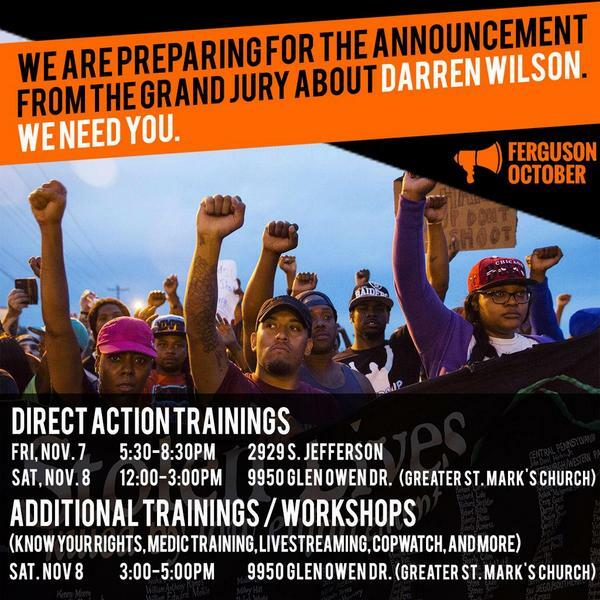 Street medics will be at two upcoming direct action trainings in St. Louis, and leading a health and safety in the streets training immediately following Saturdays direct action training. See the flyer below for more information. This full day course covers basic first aid knowledge for taking care of yourself and your friends at protests. Going more in depth to the information covered in the shorter Health and Safety training, this training will also cover basic first aid for injuries common or catastrophic at protests, including hypothermia, breathing emergencies, head trauma, car accidents, and gun shot wounds. This training will also be for healthcare providers who want to help staff first aid stations or help on the street during the expected protests. Note that this is not a CPR course, any official certification, or the full 20-hour Street Medic Training designed to train people to run as marked medics providing care for an entire crowd of protestors. Sliding scale $0-30, lunch provided, participants will receive a first aid kit.